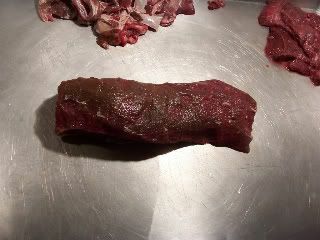 Tim's morel mushroom thread reminded me that I had not posted pctures of this stuffed venison CB. 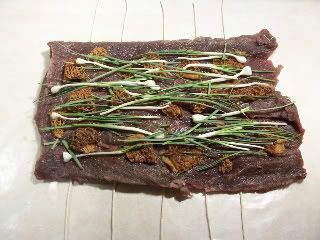 Just one more use for morels. 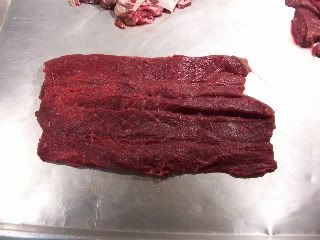 This is part of a backstrap from a doe I got this fall. 1 clove of garlic... minced. 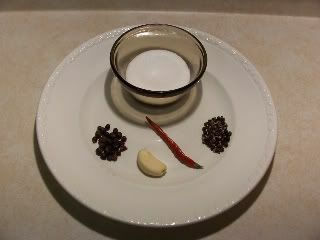 I crushed the cayenne, juniper berries and black pepper corns, then mixed them with the tenderquick/sugar mixture and added the minced garlic. 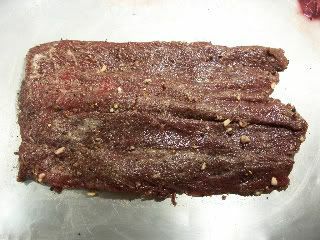 Rubbed the mixture into the backstrap covering all edges, and picked the meat up and gave it a shake to get rid of any excess cure. I wrapped the slab in plastic wrap and let it cure in the fridge for 3 days. 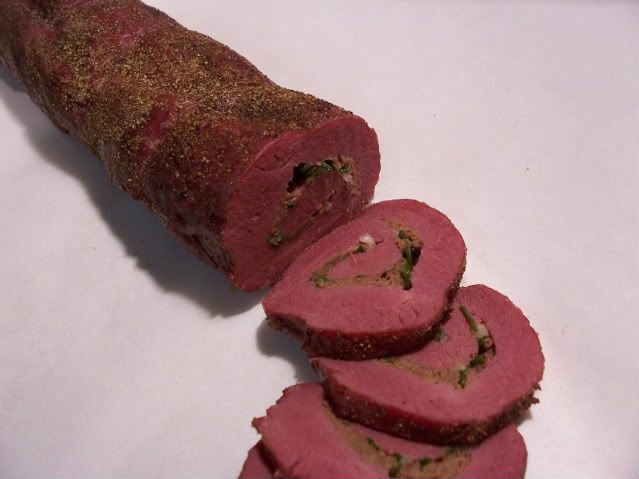 Rolled up and onto the smoker with some hickory. I added a few potatoes and an onion for another meal. 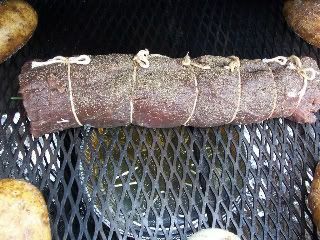 I smoked to an internal temperature of 150, wrapped and rested. 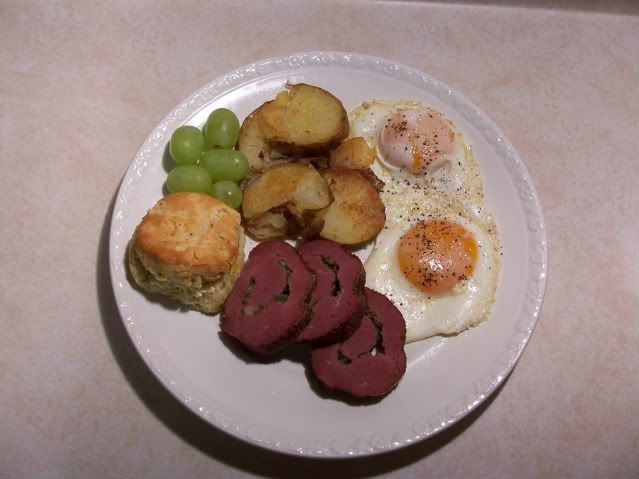 The venison canadian bacon, fried smoked potatoes, cheese/herb biscuit and some fresh eggs. Thanks for checking out my breakfast. Darn, I must have not heard the dinner bell. That looks great. 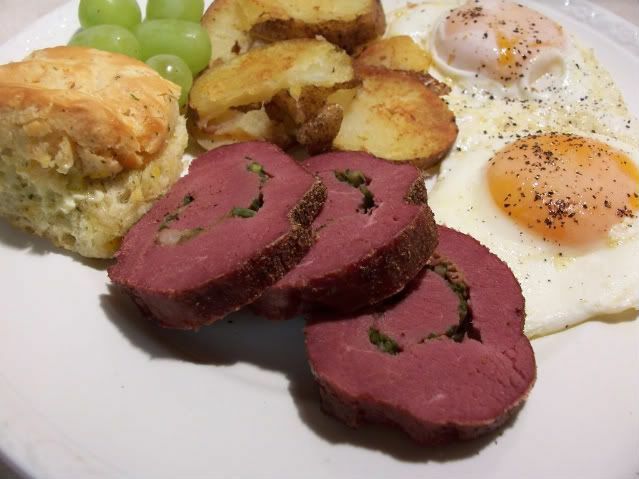 Bet that was real good with those eggs and potatoes. man that looks good cowgirl! 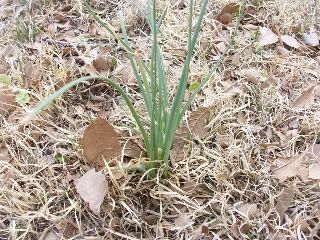 i never knew you could use those wild onions for anything! what else would you use them for? Looks great Jeanie. Haven't had lunch yet, NOW I'm really hungery. Thanks for the pics. I don't hunt but sure looks good !